I really debated on posting this. I typically don't comment on any books I read because I enjoy reading and I want people to read. I don't want someone to discourage anyone from reading. But I was so appalled by the overwhelming cheers from thousands of LDS women and teen girls that I have to comment on Twilight. I'm definitely behind the times. Twilight came out awhile ago (2006? ), but I hadn't really heard of it until last year when I went to Utah. Then I couldn't get away from it. After a couple of friends encouraged me (i.e. browbeat me into it), I finally decided to get it. But, the hold line at the library was ridiculous and I'm too cheap to buy a book that I'm not sure I'll like. So, for my trip to Hawaii, I finally found a copy from a Young Woman in my ward. Her well-used copy was placed in my suitcase and off I went. For those who don't know (is there ANYONE who doesn't?) 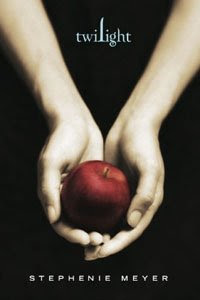 the story is about a teen girl, Bella, who meets a vampire, Edward. They fall in love and the fun begins. I'll try not to give too much away, but let's face it: it's a love story--boy meets girl, they fall in love, some type of obstacle comes up and they overcome it to live happily ever after. So, let me just tell you what irks me about this book. Why does Bella love Edward? Let me quote her, "....he looked like he'd just finished shooting a commercial for hair gel. His dazzling face was friendly, open, a slight smile on his flawless lips." That was Bella's thoughts when she first met Edward. And it never changed. She always thought about his beauty, his perfectness. She never talked or thought about any of his characteristics. She declared her love before she even knew much about him. Why does Edward love Bella? Well, to put it succinctly....because she smells good. He is addicted to her blood (notice not just blood, but her blood calls to him). He struggles throughout the book to resist the call of her blood. This book is very sensual. True, they don't do the deed, but I can tell you my heart beat faster in some parts of the book. Is it appropriate that a person you are dating to purposely arouse you? And then turns his/her back and actually tells you that it's your fault? Where I come from, that person is called a tease (well, the G-rated version of a name). It's wrong. Lust and arousal are natural feelings, but we are taught to control them and to take care to not invoke those feelings in others. But Edward has no hesitation to tempt Bella, then caution her to control herself. There was one scene that really torked me. Edward is kissing her neck (hello! girls are pretty sensitive on their neck!) and telling her all the reasons he can't be with her. He then tells her that she has to control herself around him so he won't bite her. What?!? You're kissing my neck, and telling me that I need to be careful so you won't bite me? What about controlling yourself? You could start by not kissing my neck or placing us in situations that would be tempting. Why does Bella have to have the responsibility in this relationship? Another point that bugged me. Edward was over 80 years old. He "died" when he was 17, so he looked seventeen, but he has lived and experienced life for over 80 years. Wouldn't you think that he was mature and thought/felt as an adult? Then why is he interested in a 17 year old girl? Doesn't that seem a little...perverted? I suppose I wouldn't have as big a problem if she were older, but as a 17 year old, she is still a child in many ways. Why would an 80 year old be interested in a 17 year old? Yeah, that's what I was thinking too. I'll finish with one other thing that I just didn't like. Bella's attitude regarding her parents was horrific. She only calls them Mom and Dad to their face--to everyone else, she uses their first name. She thinks her father is a redneck who is just there to provide a house for her--she has to take care of him. She thinks her mother is incompetent and even mentally challenged. Here's the thing. I see how teens can be drawn in with this book. Bella considers herself an outcast, loner, different than the other kids. Nearly all teen girls feel that way about themselves--no matter how popular, smart, or accomplished they may be. Teen girls are notorious for having low self esteem. They can relate to Bella. And Edward has the swoon factor--he's gorgeous. It's every girl's dream that the hot, mysterious, and brooding older guy notices her uniqueness and chooses her over all the other beautiful girls. But, isn't this book just contributing to the problem that people have of not understanding love? Relating romance and lust/instant attraction to a true unselfish, unconditional love that will last through the hard times? I suppose if you're looking for fluff reading, then Twilight will fulfill that want. But, I can't get past some real issues that I have with this book. I can't bring myself to even desire to read the rest of the series. I have to admit that I'm actually sorry that I didn't like this book--I love vampire stories (good-looking men sucking on my neck thrills me). Ok, friends, bring it on...tell me where I'm wrong (even though I know I'm right). After being away from home for a month, I'm busy! I'll really try to get up pics from Hawaii this weekend, but I'll have to mow and prepare a lesson for Sunday. Since I absolutely abhor mowing, it takes me forever and a day to get it done. In the videotape of life, you really should take a moment to watch me mow my lawn--it's quite entertaining as I mutter and grumble to myself, make faces, take a break every 15 min and generally act like a spoiled rotten brat. BTW, can I just tell you how excited I will be for November 5, 2008? Actually, it's a catch 22 feeling. The elections will be over, so no more stupid ads to listen to, calls from the DNC or GOP to ignore, or flooded election news on TV to scoff at. BUT, I'm afraid that we will be swamped with info about the president-elect. Which I will go on record and say that I think America will see her first black president--that's my prediction. And then I'll have to hide my money to share my wealth with people I choose. We've had several women become pregnant while working for my company. I suppose that's what you get when an office of 50 has about 7 men. One woman had tried for about a year or so to get pregnant. Her sole goal was to start a family and at the age of 23 she was very discouraged that it was taking so long and would lament about her difficulties. Then one day, she came to the office excited that she had a doctor's appointment that day. She thought she was pregnant, but wanted it confirmed with her physician. She came into the office very chipper and bouncy. As she left to go to her doctor's appointment, she fairly flew out the door. She returned to the office later that day and announced that she was indeed pregnant. What was interesting was that she was now very happy, but her walking had changed. Instead of being light on her feet, she now waddled and held her back due to the newly acquired back pain. In the space of a few hours, her pregnancy affected her ability to walk and sit. As her pregnancy progressed, she was very vocal about her symptoms of nausea, back pain, ravenous eating, swelling body, etc. One afternoon, another lady returned from lunch. As she began to pull her chair out of her desk to sit down, she noticed that there was something under her desk! Lo and behold, preggo girl was so tired at her 10th week pregnancy that she had to take a nap. She chose to sleep under a cow-orker's desk instead of her own! When asked, preggo said that the baby was making her exhausted and she chose the cow-orker's desk since it faced away from the hall and no one would disturb her. That happened several years ago, but whenever someone at work complains of fatigue, we simply suggest crawling under their desk to nap--it worked before. I've been saying for a long time that I should write some memoirs of the stories from my place of employment. We've had some doozies. So, I'll start with one of the most bizarre. A few years ago, I worked with a woman who was "interesting." She just didn't think like others. As I was chit-chatting with another female cow-orker, she came up to tell us that she had had an accident in her underwear (she was wearing a dress that day). She continued her story by telling us she took off her underwear, washed them in the restroom, then took them outside to hang them to dry. We asked her where she hung them. She said she placed them on top of a bush (all the bushes were in front of actual offices). Thus, someone in another office could gaze out of his window and find pink women's underwear on the bush directly next to his window! I couldn't understand why she didn't go to the Target or Walmart that is literally a 5 minute drive from our office to purchase new ones. Nor could I understand why she choose us to air her dirty laundry (pun intended). Later that day, she reported to us that her underwear had dried and she was able to put them on....while behind the bush. When we asked her if anyone was in the office, she asked us, "What office?" She didn't know that behind the big window she stood in front of was an office with people who really work there. I belong to a few online forums. For those who don't know, a forum is a place to express thoughts and ideas, usually on a topic. I belong to primarily LDS forums--I don't want to be involved in a place that is immoral or uses language I'd rather not hear (read). I ran across my first forum by accident. I was looking online for something and ran across the website www.nauvoo.com. I thought it was a website about Nauvoo, IL. What I found instead was a group of people who had firm testimonies, strong opinions, and a desire to be perfected in Christ. I "lurked" for a long time (meaning, I read the forum, but never participated). Finally, I decided to join and have a chance to interact with them. Last year, I began communicating with one of the posters from Nauvoo. Through emails and chatting, we really got to know one another. When I decided to go to Utah for Education Week, she offered her house as a hotel. I also got to know a couple of others from Nauvoo and one of them offered a resort to share the cost of staying near BYU. I thought it was a great opportunity to meet new people and make new friends. My friends at home thought I had lost my mind. They were appalled that I had agreed to not only communicate with complete strangers, but actually stay with them. I never once had any misgivings about any of the people with whom I would stay. What I found difficult to explain was that I really believed them to be members of the church who were honorable. They asked me how I knew they weren't lying to me. The Church has its own jargon--very distinct. It's usually pretty easy to spot someone who is lying because they will use the jargon inappropriately very quickly. Since they don't belong to any organization like the Church, they couldn't understand my explanation of the jargon. Not to mention that the gift of the Holy Ghost adds an assurance. That experience made me realize what blessing the Church is in another unexpected manner. I've been to church services in many places including Washington DC, Florida, Hawaii, Bulgaria, Columbia, California, etc. Although there are some differences, they are minor. I know exactly what to expect in each ward I attend. In addition, I can know when someone is actually a member of the church and have a level of trust with that person. There are no guarantees in life nor are there perfect people, however, knowing someone is a faithful member of the Church allows me to know things about that person. And I can trust that part of that person. I'm grateful to the church for so many reasons. One of which is my ability to "know" someone instantly when I learn they are faithful members of the Lord's Church. I was watching one of my favorite channels, The Food Network. Rachel Ray has a new show (yes, her 1,385th) in which she and her husband go to a city on vacation and eat. Recently, they were in Montreal eating at these fancy restaurants. You know the kind. A huge plate with 2 oz of food in the middle and drizzled oil or something to decorate the plate. Anyway, this restaurant was named "Pied de Cochon." It sounds so nice...it's French so it sounds wonderful. Do you know what it means? It means "The Pig's Foot." That made me think. Here in Indiana, a restaurant called "The Pig's Foot" would be a barbecue joint that used paper napkins, plastic forks, and served pulled pork sandwiches and greens. In Montreal, this place served fish egg decorated plates of gold plated salmon--literally--there's a gold leaf that you can eat. I was reminded of an anniversary party I went to a couple of years ago. It was the 50th anniversary of a lady at work. They had a to-do at a hotel which catered a three course dinner. Very nice ambiance. While being served our dinner, I remarked to my cow-orker next to me that my family is very different from this family. My family would have an anniversary party in our backyard with paper plates and soda cans. Our entertainment would have been each member of our family making fun of another member of the family (oftentimes, I fall in the latter category). Instead, I ate a three course dinner, refusing offers of wine of various vines, while being regaled with tales of adventure and culture of this couple as they celebrated 50 years together. Although I was able to fit in nicely, I think I would enjoy "The Pig's Foot" more than "Pied de Cochon". It's fun to dress up and have professionally prepared food. I enjoy celebrating accomplishments of my friends. But I have to say that I'm a hick--raised in a barn, dyed in the wool, slap your momma hick. Let me eat with my fingers, drink soda out of a Mason jar, wear my jeans and feel the grass under my bare feet--that's talking to my hick heart. Do you ever have those moments when you meet someone and you just know you've met them before? People think they have already met me a lot of times--I must have a very common looking face. But, it's not often that I meet someone that I know I met before and not remember. Mom told me that when I was a baby, she and I were in a grocery store and I saw a man. I immediately smiled and held my hands out to him to pick me up. She said I could not keep my eyes off of him and it was apparent that I recognized him. What made this even more unusual was the man was a black man--and I had shown fear of black men in the past. Mom loved to tell the story of when I was a child and saw a black man and screamed "A monster, Mommy!" while pointing to him. Once when I was in a store, the cashier recognized me and immediately began talking to me about the party we attended the weekend before. I didn't know her and had not attended a party the weekend before, but thought I'd just have some fun. I made non-committal noises until she realized that I was not who she thought I was. Recently, I went to Cincinnati to do a presentation. We met with potential clients and their brokers. While I was shaking hands with one of the brokers, we both asked simultaneously, "How do I know you?" I recognized her as someone that I had met and spent a little time with, but didn't "hang out"with her. I thought that that meant I knew her from a church function. So I asked her, "Are you LDS?" When she looked puzzled, I realized that she is NOT Mormon and so I explained that if she didn't know what that meant, she isn't. I let her know I was Mormon and thought maybe we knew each other from church. We never did solve the puzzle of our acquaintance. Our paths have never crossed in educational or professional pursuits. But, I still think I know her somehow. How does this happen? I'm sure that sometimes it is simply a matter of looking like someone else. But, how do you explain those instances when they aren't? For example, when little children seem to recognize a stranger. I've always been told it was a "spiritual recognition." Perhaps that is it. I know that I've felt a connection to someone (not necessarily recognizing them, but feeling that instant connection) and wondered if that connection started pre-mortally. I wonder and hope that the same experience will happen when I see Jesus. I want to exclaim, "I know You!" Afterall, He knows me and His eyes will have that light of recognition when we meet again. I returned from my trip to paradise. It was fabulous! When I get a chance, I'll post some pics and stories. I returned home to find that my car battery had given up the ghost. My friend, who used my car to take me to the airport, left my lights on all week long. Thankfully, my cute-younger-than-me-and-so-out-of-my-league neighbor was home (he's a cop--have I mentioned my previous obsession with police officers?? ?--it doesn't help with my infatuation with Cute Boy). He was able to jump my battery (I mean my car battery! although my battery gets a little jump when I see him). I then traveled to Kansas City MO the next day to work 2.5 weeks in training new employees. While there, during lunch, one of the guys who works in the lunchroom and I struck up a conversation. He complimented me on my eyes and then asked me out! Whoa! That hasn't happened in...well...longer than I care to admit. I was very flattered and although he seems nice enough, not truly interested. First and most importantly, he is not a member of the Church. The scary thing is, I actually considered accepting simply to stroke my ego. I realized that as a woman I loved getting compliments from anyone. I often get compliments on things in which I have utter confidence--my work abilities, my testimony, my social behavior, etc. But, those things in which I have little confidence craves attention. As a single woman in the Church, women pay me compliments often--men do not. I don't meet single men in the Church (at least not of a legal age) and married men do not compliment me (rightfully so!). As I contemplated his offer of a date, I thought of accepting to have something to do while in another city, or to go out on a date--something I haven't done in a very long time. But I realized that my desires were very selfish--I was thinking of what I could receive from a simple date. I didn't even consider that by accepting I may be implying more of an interest. Hadn't I always told myself that I wouldn't date non-members? As I traveled home, I worried that my car battery would need to be jumped again. After all, it had been sitting a very long time without a spark. I laughed as I realized that my own battery had received a jump after an extended time period without a spark. My car battery had kept its juice and started easily. How long will my personal battery last with its latest jumpstart?? ?